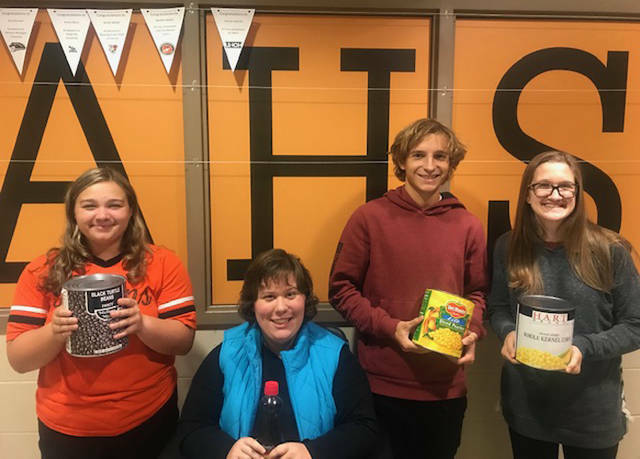 Arcanum High School National Honor students Makenna Gunckel, Mary Trittschuh, Tanner Delk and Celeste Arnett are helping with the Arcanum NHS Trick or Treat Canned Food Drive. ARCANUM – The Arcanum High School National Honor Society once again is sponsoring its Trick or Treat Canned Food Drive. During the Arcanum community trick or treat on Oct. 28, high school students will canvas the town to collect non-perishable food items for local food banks. Anyone who would like to donate may give their items to AHS students during trick or treat. Those who would like to help but will not be home during the trick or treat event may leave their items on their front porch or drop them off at the high school. The Arcanum NHS’s goal is to feed those in need in Arcanum for an entire year.